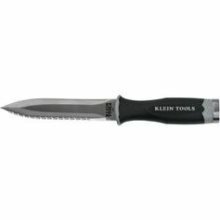 Wylaco carries an extensive line of top quality specialty industry specific knives such as lineman's skinning blades from Klein Tools. If you cannot find what you are looking for please call us at (800)-876-2325 and one of our experts will assist you. Toolless Blade Change Trigger grip for cutting on the pull Storage for up to 10 blades Irwin Bi-Metal Blue Blade Ergonomic cutting angle ..
Klein Tools 1550-11 Pocket Knife - 2-1/4" Carbon Steel Coping Blade Klein Tools, Inc. represents much more than Klein pliers. The company's product line has broadened to include virtually every major type of hand tool used in construction, electronics, mining, and general industry in addition to the electrical and telecommunications fields. Klein Tools 155.. Since 1857, the company operated by Mathias Klein and his descendants to the fifth generation, has grown and developed along with the telecommunications and electrical industries where Klein pliers first found major usages. Today, Klein Tools, Inc. represents much more than Klein pliers. The company's product line has broadened to include virtually every major type of hand tool used in constructio.. Features Heavy-duty serrated steel blade for saw-action cutting. Three-inch steel blade withstands frequent scoring and slitting of cable jacket. Blade and ring are securely molded in handle. Notch on blade back for scraping or removing wire insulation. Comfortable textured handle with finger grooves and guard. Rectangle-shaped handle design for attachment to some utilit.. Features: No contact between stainless steel ring and hardened steel blade. Three-inch steel blade withstands frequent scoring and slitting of cable jacket. Blade and ring are securely molded in handle. Notch on blade back for scraping or removing wire insulation. Comfortable textured handle with finger grooves and guard. Rectangle-shaped handle design for attachment to ..
Klein 44151 Specifications: • Blade Length: 3-3/4" • Length Closed: 5-1/2" Klein 44151 Features: • A rugged, versatile sharpener featuring fine craftsmanship and unique design. • Blade unscrews and stores in handle for convenient carrying in tool box, pouch, or pocket. • Blade is precision-cut, hard-chromed steel for accurate, consist..
INCLUDES: • (1) Serrated Duct Knife FEATURES: • Cuts duct board and flexible duct • Double-edged knife-regular and serrated • Puncture resistant nylon sheath with belt loop • Cushion-grip handle for comfort SPECIFICATIONS: • Length: 5-1/2" • Weight: 8.4 oz. .. Features: Starts sharper and stays sharper than standard heavy-duty blades 3-position, retractable blade; blade storage in handle Patented interlocking nose holds blade securely Includes 3 blades Stanley's limited lifetime warranty .. Features: Engineered for general-purpose cutting Precision-honed edge for consistent and extended cutting life Fits most standard utility knives ..